Two teenage schoolgirls were killed and five people injured when a speeding truck allegedly hit a motor cycle and later crashed into a tractor trailer and a van this morning at Mukundpur Chowk in the Burari area of North West Delhi. The Greater Noida Authority has, after a long interval, launched a scheme of residential plots in 120 sq mt and 200 sq mt sizes. The last date for receipt of applications under this scheme will be August 22. 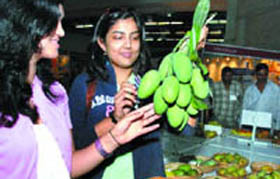 Chief Minister Sheila Dikshit today inaugurated the three-day mango festival organised jointly by the Delhi Tourism department and the India Trade Promotion Organisation at Pragati Maidan. This is supported by the National Horticulture Board also. The Delhi Tourism celebrates the festival every year. This is 20th mango festival. In order to cope up with the growing interstate mobility, the Haryana and Delhi governments on Thursday revised the agreement to increase the operation of buses in each other’s territory. The Delhi Transport Corporation (DTC) in collaboration with Svayam, an initiative of Sminu Jindal Charitable Trust, will ensure that the upcoming Phase — III Bus Q Shelters are accessible to all users be it the elderly or the disable people. 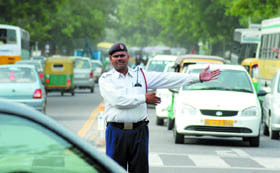 A thankless job with little appreciation whatsoever, the Delhi Traffic policemen entrusted with the responsibility of managing traffic on the capital roads are finding it tough to cope with the rigorous demands of their profession. The mounting medical leave application of the traffic cops is an indicator that all is not well in the traffic department of the Capital. The Municipal Commissioner of Delhi today suspended two officers of the education department on charges of irregularities in the appointment of teachers on contract. A large number of MCD teachers under the banner of Akhil Delhi Prathmik Shiksha Sangh today demonstrated at Town Hall, headquarters of the Municipal Corporation of Delhi, in protest against the Delhi government’s order for deploying them on election duty. The Karnataka State Open University (KSOU) has set up a regional centre in the National Capital Territory of Delhi to cater to the needs of North Indian students. Thousands of passengers had a narrow escape as an express train, Lichhwi Express, was running behind a goods train on the same track near Khurja on Thursday. Terming the student-teacher relationship a “pious” one, a city court Friday awarded life imprisonment to a teacher who pushed his 15-year-old student to her death from the roof of a west Delhi coaching institute in 2001. With the arrest of three persons — Karan, Ganesh and Sanjay yesterday from Kotla village, the South district police has busted a notorious gang of burglars. Eight cases of house theft and burglary have been solved with their arrest. The South district police yesterday arrested three gang members near the Garden of Five Senses at Said-Ul-Ajaib for the robbery at a farmhouse in the Mehrauli area of the Capital on the night of June 29. The Delhi Police yesterday arrested two people with a leopard skin worth Rs 5 lakh. The accused have been identified as Mahesh, resident of Madangir and Mohan of Uttaranchal. The girls were students of Government School in Shalimar Bagh and have been identified as Anjali (14) and Neelam (17). The Hero Honda motor cycle on which the girls were riding on their way to school was being driven by Anjali’s father Jagdish (50), who has received multiple fractures in his arms and legs. After colliding with the motor cycle, the truck smashed into a tractor trailer and a van, leaving five people, including the truck driver, injured. The girls, student of classes X and XII along with Jagdish were rushed to the Jaipur Golden Hospital. While Anjali and Neelam were declared brought dead, Jagdish is undergoing treatment. He is reportedly out of danger. The tractor trailer occupant Jawahar and Prashadi Lal along with Sikander, the van driver, are recuperating at the hospital. The accident took place around 6.30 am when the traffic on the road was comparatively less. According to eyewitnesses, the truck was moving from the Inter-State Bus Terminus to G.T. Karnal Road and the driver Ram Niwas (34) was also injured in the accident. A case of rash and negligent driving has been registered against the driver at the Adarsh Nagar police station. The forms for this scheme will be available from the divisional banks in UP besides Noida and Delhi. For quite some time, the GNIDA was preparing to launch a residential plots’ scheme which was finally launched on July 3. The chairman of Greater Noida Authority, Lalit Srivastava said residential plots will be allotted in two sectors of Greater Noida and plots will be of 120 and 200 sq mt. sizes. A draw for allotment will be held on December 22. Application forms will be available from different banks in Delhi, Kanpur, Ghorakhpur, Varanasi, Barielly, Muradabad, Lucknow, Ghaziabad, Allahabad, Agra, Meerut, etc. Forms can also be downloaded from the Greater Noida website. A demand draft of Rs 1,100 will have to be submitted for the application form. This time also GNIDA has failed to make forms available to different banks. People from different places had complained that forms were not available in the banks. There are 425 plots of 120 sq. mt in Sector-XU, and 523 in Sector-3 while 929 plots of 200 sq. mt. will be available in Sector-3. In all 90, 111 and 197 plots have been kept for reserved categories respectively in the three categories. Mango has a prominent place among fruits. It is closely associated with the history of Indian horticulture and is known to the country for over 4,000 years because of its delicious taste, captivating flavour and nutritive values, the Chief Minister said. The first day of the mango festival saw some of the juiciest and most exotic mangoes from across the country. Mangoes that had the camouflaging look of fruits like banana, guava, and watermelon but retained the intrinsic taste of mangoes were the cynosure of all eyes. The 20th Mango Festival offers a package of fun for families. Apart from over 500 mango varieties, the first day of the festival saw a cultural programme by the Sahitya Kala Parishad in the evening. The festival promises a fun-filled weekend with a mango eating competition for men and women, cultural programmes, mango quiz, slogan writing, magic show and other programmes. The entry to the festival is free. However, the entry ticket to Pragati Maidan is applicable. The CM felicitated the Padma Shri awardee Kaleemullah Khan of Abdullah Nursery . Heis a record holder for cultivating a tree with more than 375 varieties in his orchard at Malihabad near Lucknow. The Reciprocal Common Transport agreement signed by the transport ministers of Haryana and Delhi Mangeram Gupta and Haroon Yusuf respectively allows authorised buses of Haryana to operate on over 1.64 lakh kilometers daily in the Capital’s territory. While Delhi buses can operate on over 1.95 lakh kilometers daily in Haryana. The ministers expressed hope that the agreement would facilitate greater interstate mobility, which would help in social integration as well as give a boost to the economy of the two states and also the country. The agreement has been revised after a gap of about two decades at a function in the evening at Rajhans Hotel in Surajkund near here. Giving details of the agreement, Mangeram Gupta said that there was persistence from the Union ministry of urban development to finalise and execute the agreement. As per the old agreement, the buses from Haryana used to cover about 65,000 kilometers daily in the territory of Delhi. While, the buses from Delhi could traverse only about 91,000 kilometers in Haryana. As per the revised agreement, out of the total area allowed for the operation of Haryana buses, about 64,000 kilometers will be within the NCR and the remaining outside it. Out of the total area allowed for the operation for Delhi buses, about 1.7 lakh kilometers would be within NCR and the remaining outside it. According to Mangeram Gupta, a similar agreement has been signed between Haryana and Rajasthan. The final draft of the agreement between Haryana and Uttar Pradesh is in the final stage and it will be operational within a fortnight. The DTC said that it had accepted Svayam’s recommendations for improving the accessibility to New Bus Shelter Design under Phase – III. Sminu Jindal, founder of Svayam and managing director of Jindal SAW said that Svayam believed that the greying population along with the handicapped are further disabled by the environment and an inaccessible transport system that prevent them from taking part in social, recreational, educational and business activities. The Bus Q shelters will also provide tactile warning blocks and beepers to assist visually impaired people and visual display systems for people with hearing impairments,” he added. “Although it is not possible to give the exact figure of traffic constables who went on medical leave, but I am sure the trend is on the rise. We are also aware that half of them are fake but generally ignore them,” said an official attached to the office of Joint Commissioner of Police (Traffic). The plight of a traffic cop in the Capital is often forgotten amidst the traffic chaos and harrowing road experiences. A typical day in the life of a traffic cop begins at 5 am when he travels from about 30 to 50 minutes to his assigned intersection depending upon the distance from his house. He is at the spot by 6.30 or 7 am and then takes his position in the middle of the intersection by 7.15 or 7.30 am depending upon the traffic flow. He is on his toes along with a colleague till 11.30 am until the traffic diminishes. The period between 12 noon and 3.30 pm is a lean period before the evening traffic again puts them on their toes. A strict vigil is kept on the intersection from 4.30 to 8.30 pm. The ordeal ends around 10 pm, which is if all has been smooth. Then catching a bus and travelling back home and sleeping by 12 midnight to be up again by 5 am. Besides VIP movement, daily target of 30 challans and depositing the money, accidents, red light failures, jams, vehicle breakage and his 16 hour-a-day duty is complete. “We do not have time for lunch or tea. This intersection sees the daily movement of our police commissioner, joint commissioner of traffic and Lieutenant Governor about two to three times a day. We cannot relax at all. It is a pleasant day for us if everything passes by smoothly here,” said a traffic cop at ITO intersection. A metropolitan with huge boundaries, residents having almost no traffic sense and daily movement of around 50 lakh vehicles, the staff of around 5500 traffic police is short by any standard. The piling medical leaves have a reason. “What medical leaves? We keep running from traffic inspector to ACP for two days’ leave but they do not understand. At last, we go home and send a medical certificate and instead of two days, take a week’s off,” said Sunder Singh (name changed), a traffic constable. His colleague Bharat Rana (name changed) adds that the medical leave is the only option left before them as otherwise nothing except death in the family gets them a leave. “I know a colleague who has applied for a medical leave but is actually going for a land registry. These are important works which cannot be averted. However, when you know that telling truth would not get you leave, tell a lie,” says Rana. With little salary and virtually no weekly off, the morale of the traffic cop in the city is quite low. It is time the Delhi Police brass gave a thought to their colleagues on the road, otherwise, time is not far when the genuine medical leave applications will crowd their tables. They urged the government to exempt the teachers from election duty. Addressing the teachers, ADPSS president Giri Raj Sharma said that 13,000 teachers of the MCD schools had been engaged on election duty. A total of 15,500 teachers are there in MCD schools. When such a large number of teachers are on election duty, how the teaching work could be done, he asked. The ADPSS submitted a memorandum to the Lt Governor, Mayor, MCD Commissioner, Chief Secretary of Delhi and Chairman Standing Committee, MCD Prithviraj Sahni. This is the first regional centre of the Mysore-based Open University outside Karnataka. KSOU vice-chancellor B.A. Vivek Rai said that the role of open universities in the country was important because the regular universities of the country catered only to 20% of the students. The situation was caused by the faulty traffic signal–red and green light, due to which goods train and Lichhwi Express train were running on the same track. The station master informed his superiors that the driver had crossed a red light signal. Due to the presence of mind of a staff, the power connection of the train was disconnected. The driver, assistant driver and passengers of the express train could not understand as to what was happening. As a result passengers were stranded for two hours. Lichhwi Express running between Samstipur and New Delhi was on its way to Delhi. The train had stopped near Kamalpur station due to red signal at 8.05 a.m. but after two minutes as the signal turned green, the train moved ahead. At 8.10 a.m., a message was received from Kamalpur station master that the driver had taken the train further in spite of a red signal. Quickly a message was received for disconnecting the power supply to the train. By this time express train had already pick up speed and was running behind a goods train moving on the same track. There was panic among the railway authorities when they learnt that an express passenger train was chasing a goods train on the same railway line. Senior officers from Allahabad and Tundla reportedly reached the spot and the express train was brought to Khurja station. Driver Shyam Sunder and assistant driver Sher Singh were taken into custody by the railway police and got medically examined by a doctor. The train was allowed to move towards Delhi at 10.28 a.m.
Additional Sessions Judge D.K. Sharma also fined Ravi Kumar Ghai Rs.20,000. “The murder was committed in a cold-blooded manner and the accused has betrayed the pious relationship between teacher and student, so he deserves nothing less than spending the rest of his life in jail,” the court ruled. It was September 2, 2001, when Ghai, who runs a chartered accountant coaching institute in West Patel Nagar area, pushed his 15-year-old student from the roof of the building and fled to the class. The prosecution relied upon 24 witnesses to prove the case. During the investigation, the police recovered some love letters from Ghai’s house allegedly written by the girl. However, Ghai in his defence said she committed suicide because she was upset as she had not done well in her studies and could not fulfil the expectations of her parents. Electronic goods, cameras, watches, silver utensils, gold jewellery worth lakhs of rupees have been recovered from their possession. They were arrested when they tried to flee on seeing a police team. They revealed that Sanjay, his brother Ratan and associate Ganesh were seasoned burglars and several cases were registered against them. Sanjay has been involved in 11 cases while Ganesh has been involved in 3 cases of burglary. They usually targeted urban villages and government colonies close to the Ring Road in South district. They use to come to the targeted area in the evening and sleep in the public park. Then they got up late in the night and roam around in the lanes looking for isolated house and shops that were locked from outside. They disclosed that they were involved in several cases of theft and burglary during the last few months. Meanwhile, the police is looking out for their other associates. The accused – Manoj, 23, Ram Kirpal, 26 and Pramod Kumar, 18 are residents of UP. A .32 bore US-made revolver with 15 live cartridges, a dagger, Rs 5,800 and one digital Konika camera along with five mobile phones have been recovered. Ram Kirpal disclosed that he had earlier been involved in cases of burglary and Arms Act in the Mehrauli police station area. He had worked as security guard at the farmhouse about two and a half years ago and was well acquainted with its topography. He knew that the owners were rich. They owned the Mohindra Hospital in Green Park. According to DCP (Crime), A.S. Cheema, it was learnt that two persons would be meeting at Samaipur Badli to finalise a deal in a leopard skin, which is prohibited by law. A raiding party under the supervision of ACP Sanjay Bhatia was constituted and put up at Samaipur Badli T-Point. “Around 10 p.m., our raiding team saw two persons carrying a gunny bag and moving suspiciously. When they were stopped and questioned, the two tried to escape but were apprehended by the team. A leopard skin was recovered,” said DCP Cheema. Mohan has confessed that he had poisoned the leopard at his village and was bringing the skin to be disposed of in Delhi through Mahesh, when he was caught. Mahesh had promised him a handsome amount for the skin. A case under the Wildlife Protection Act has been registered.